Brenda Feigen Fasteau arguing about candidate support while Ms. editor Gloria Steinem, NOW President Wilma Scott Heide & feminist/author Betty Freidan look on, during meeting of the National Policy Council. As the ever expanding arguments we have about our society continue to splinter every moment, every tweet, and every out of context comment gets turned into a new hashtag du jour and a new movement suddenly appears out of the ether. In this chaotic atmosphere, all of the sudden it seems like everyone is marching, protesting, feeling the need to be heard, finding a safe space, and looking to express some sort of outrage, no matter which side of these arguments we find ourselves on. We all feel attacked, insecure, unsure. And our need to jump onto every micro bandwagon has created a culture clash of epic proportions. Just this week alone, we are forced to take sides about an episode brought on mostly because of a bottle neck of opposing protests and marches. Too many marches, too little time and space. Just keeping up with the swiftly changing attitudes and purposes of the women’s marches alone is head spinning, so instead, we've taken a look at a bigger picture, stepping back and tuning out the daily opinion churn. We look at the history of the womens’ movements and how they were intertwined with the Civil Rights Movement, and find that overall, the most important battles weren’t necessarily the ones fought by those shouting the loudest, carrying signs and picking fights on Twitter, but rather, were those fought everyday, at every dinner table, in every home, in every decade. In other words, the real battles are those fought on the homefront. As Ruby Scalera points out in our expansive look at these intertwining stories, “It’s in the home where some of the fiercest of battles were fought. In American society, the household, the kitchen table, has long been an epicenter of change or lack thereof. 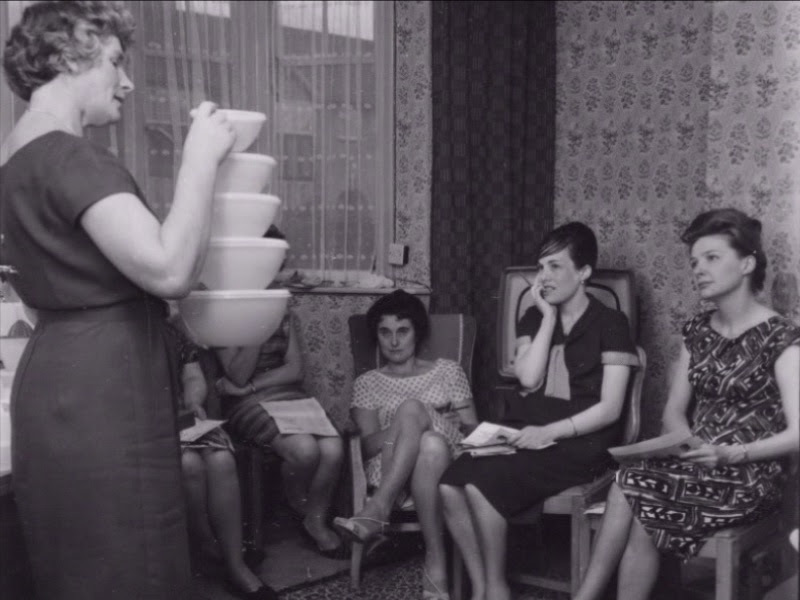 Whether pushing to open doors or actively holding the frontline against such progress, traditional homemakers, whatever their beliefs, all had one thing in common. The exercising of their power as a collective force would radically change the very nature of the American nuclear family and, indeed, America itself for good.” Read A Seat At the Table. So then, if more than half of our society is made up of women, how do we explain the disappointing history of our failure to pass the Equal Rights Amendment? It’s always our intention to say what we mean, and it’s a difficult exercise to unlearn things we take for granted, but until we are willing to face that women of all ages and political affiliations (or lack thereof) are not given equal protection under the Constitution of the Untied States, we will continue to lose the arguments to the institutions which have defined us all along. Because, of course, even women who do not personally experience all of these things are systematically still at the mercy of this inequality. Taking pure politics out of the conversation, we try to rid the talking points of words like feminism, intersectionality, and simple reproductive language because they cloud the big picture, and deny the fact that until we can see the forest from the trees, we will always be caught up in the chaos of words, the tyranny of topics and the gaslighting of groupthink. We felt it was important to also look at the definitions we've learned to blindly accept and the ever changing meaning of the phrase domestic sphere, from Brownie Wise and the rise of the Tupperware ladies to empowering lifestyle entrepreneurs of today like India Hicks, who believes “It doesn’t matter who you are and where you come from,” she says, of the women involved in her company and the many entrepreneurs and business owners she has met along the way. “Our need as women to have our voice and be able to stand on our feet is as strong whether you’ve been handed everything or whether you’ve been born with nothing.” To take ownership of the language and expand the spheres allows women to create their own power structures, through business, through family dynamics, and yes, even through legislation and political movements. We argue that there is just one sphere on the continuum, and that we are, like it or not, all in this together. Read Separate Spheres. “Brownie Wise is not the only woman to find success straddling that line of working from home, a concept that runs in direct opposition to the classic nuclear family dynamic of post war America. Companies like Avon, Mary Kay and LuLaRoe have quietly and successfully helped to undermine the idea of the classically female-run space of the home by bringing effective money making programs into those spaces. Even to stray from the trunk-sale and multi-level marketing systems is to run into companies founded upon the idea that women centric networks are untapped markets of progress and opportunities. The Wing, and its emphasis on community and networking spaces focused on women, is one such modern retelling of the same classic fairytale.” But in the end, until we pass the Equal Rights Amendment, all of these other issues will continue to be clouded by the conversation itself. However, in this context, with women themselves required to lead the battles on all fronts, they wind up shooting themselves down in the process. It's a Mexican standoff in skirts, because as women on both sides of the battle try to self define they will inevitably face each other. 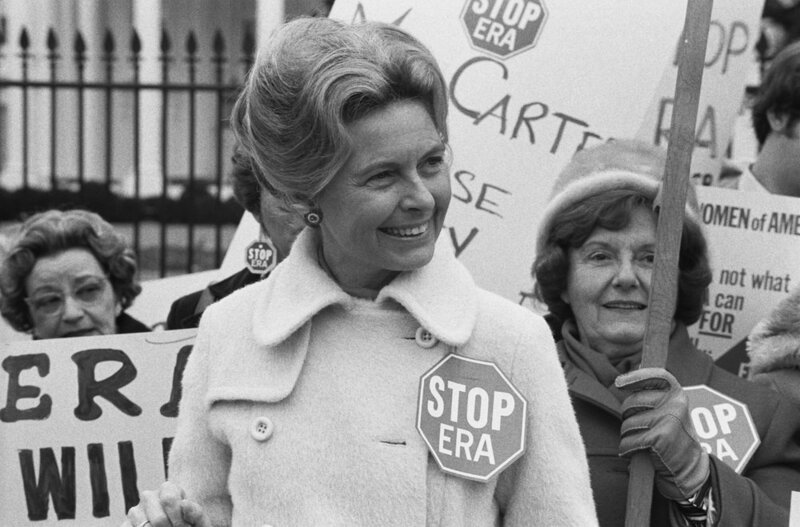 For instance, it's worth noting that while in 1972 the Equal Rights Amendment easily passed both houses of congress and was endorsed by Nixon himself, after being signed by 22 of the 38 states required to ratify, it still hangs in the balance almost 50 years later thanks to yet another women’s movement. Complicated and emotional as it all is, we will continue to examine and redefine the language we use, as definitions themselves come with a bent, because changing the way we describe things leads to changing the way we perceive them. The questions of seemingly voting against our own interests will always depend on what we perceive our interests to be. To add more context, we created a timeline of key events in the women’s civil rights movements’ history and how they correlate to culture and pop cultural happenings over the last century or so. It's incredible to see the unfolding of events, the cultural crossovers and just how far we haven't come. For the good of society, let’s try to form a more perfect union, together. Ms. Two simple letters that not too long ago changed the way women were perceived in the world for good. Though in hindsight it might sound like a clever 1970’s feminist marketing ploy, when Gloria Steinem and her compatriots launched their journal in 1972, they used the moniker precisely as is was intended; as an implicit act, promoting the removal of sexist wording from the English language. So when Sheila Michaels, a young civil rights worker in the 1960’s decided to become a one-woman lobbying force for the title as a feminist alternative to Miss and Mrs., she too, was practicing the art of re-definition. We take self definition for granted in the age of faux inclusivity where we can just simply pick one of Facebook’s 71 identity choices and call it a day. But in reality it's society, not social platforms, that puts us in our places, that define our spheres. "Mr." gives no indication of marital status, but society required women to choose between "Miss" or "Mrs” (aka married or not married). Gloria Steinem took that front and center, rescuing Michael’s idea and putting it on the cover of her magazine, itself a re-definition. It wasn’t until a forty-page excerpt of Ms. Magazine’s preview issue was published in the December 20, 1971 of New York Magazine as an insert that people began taking Ms. Steinem and her fellow journalists seriously. 300,000 test copies sold out in eight days and generated 26,000 subscription orders within weeks. 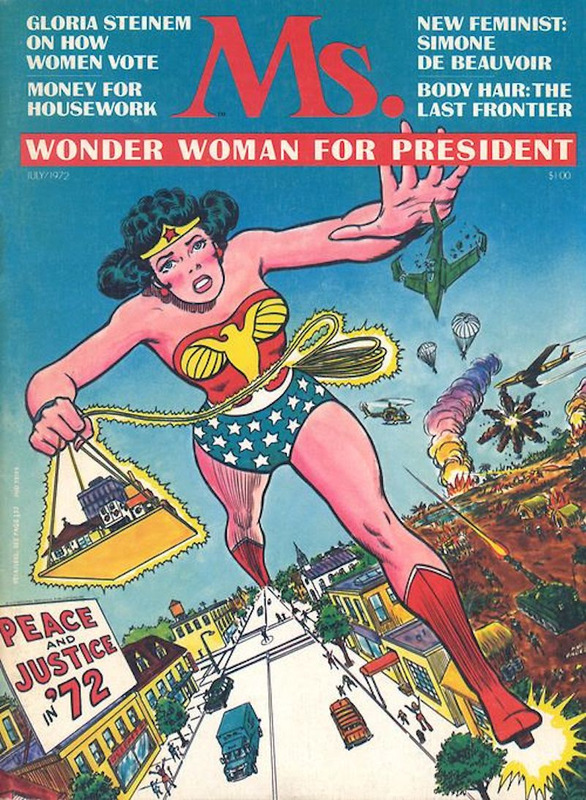 The first issue’s headline read, “Wonder Woman For President” with a picture of the iconic superheroine gracing the cover. It was loud, unapologetic, and groundbreaking. It was a picture worth a thousand words. The pages of Ms. were shaped by revolutionary editors who not only reported the stories, but lived them. They published pieces on abortion, domestic violence, motherhood, and corporate life - all from the female perspective, one that was not seen or read about in public without the myopic sense of the male gaze. It sparked both outrage and joy. Many newsstands, specifically in the south, refused to sell it. But at the end of the day, the founders of Ms. made people think and eventually ask a revolutionary question themselves: If something is happening to one woman, maybe it’s happening to other women, too? And though a lot was clearly shifting during those years, it's interesting to note that Steinem’s brainchild was born in the aftermath of the lawsuit that was the subject of Good Girls Revolt, Lynn Povich’s book by the same name, which chronicles a sexual-discrimination lawsuit filed against Newsweek in 1970 by Povich and 45 other female staffers in the complete absence of female editorial bylines. From the start Ms. was about redefining how women were presented in the world, it gave them a chance for a new identity every month. It was so much more than just a magazine, it was a movement; a cultural shifting of the spheres.